Chris Hughton has been named as the new manager of Brighton & Hove Albion on a three-and-a-half-year contract. The former Newcastle, Birmingham and Norwich boss, 56, will take charge of his first game in Saturday's FA Cup third-round tie at Brentford. Hughton, sacked by the Canaries in April, replaces Sami Hyypia, who resigned on 22 December following a run of only one win in 18 league games. Brighton are 21st in the Championship, one place above the relegation zone. Seagulls chairman Tony Bloom told the club website: "Chris has an excellent record in coaching and management. Since Hyypia's departure, Brighton have picked up four points in two games under caretaker manager Nathan Jones. 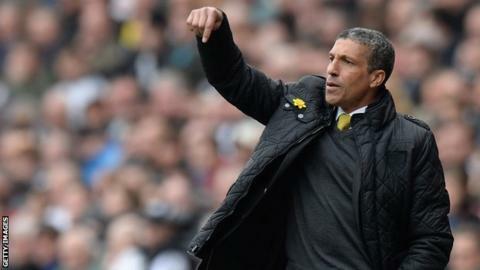 Hughton had previously said he was interested in the vacant post at Brighton, as well as West Brom, having ruled out a return to former club Newcastle. "It's a very good club and one that has a tremendous infrastructure," he told BBC Radio 4. "Anybody like myself that has been out for a while would be interested in that type of job." The former Tottenham, West Ham, Brentford and Republic of Ireland full-back was assistant manager at Spurs before joining Kevin Keegan's coaching staff on Tyneside. He became caretaker boss when Keegan left St James' Park in 2008 and took the job on a full-time basis the following year. Hughton led the Magpies to promotion from the Championship in 2010, but was controversially sacked in December of that year with the side 11th in the Premier League. He guided Birmingham to the Championship play-offs in 2011-12 before moving on to Norwich, but was sacked with five games remaining last season, which ended with the club being relegated. Brighton, meanwhile, finished in the Championship play-offs in the last two seasons, but struggled this term under Hyypia, who was appointed in the summer, two months after being sacked by German club Bayer Leverkusen.